Formerly a tobacco warehouse, Bay 7 is 10,000 square feet of flexible rental space for parties, networking, conferences, weddings and film production. Century old brick and wood, along with panoramic windows and a wrap around balcony make Bay 7 an unforgettable space. 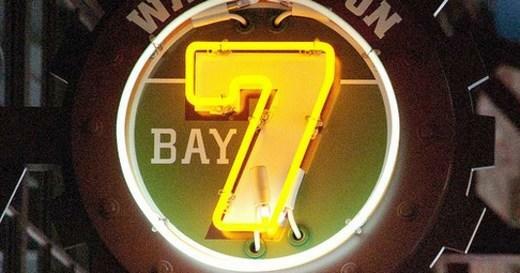 Bay 7 is located within the American Tobacco Campus, the former home of the Lucky Strike cigarette factory transformed into a one-million-sq.-ft. entertainment district, complete with apartments and offices in addition to restaurants, a documentary theater, a barber shop, a basketball court, plenty of open green common space under the iconic Lucky Strike smokestack, and more. Restaurants include offerings of authentic Italian, Cuban tapas, and classic American, as well as craft beers and other libations to make a night out of a trip to DPAC or the Durham Bulls Athletic Park, both located across the street. American Tobacco also puts on many of their own events, like art shows, pop-up shops, and free concerts in the summer.